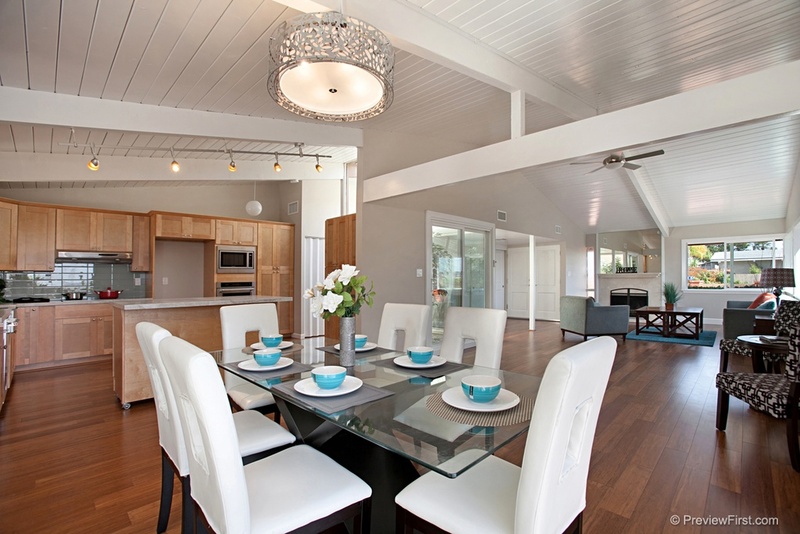 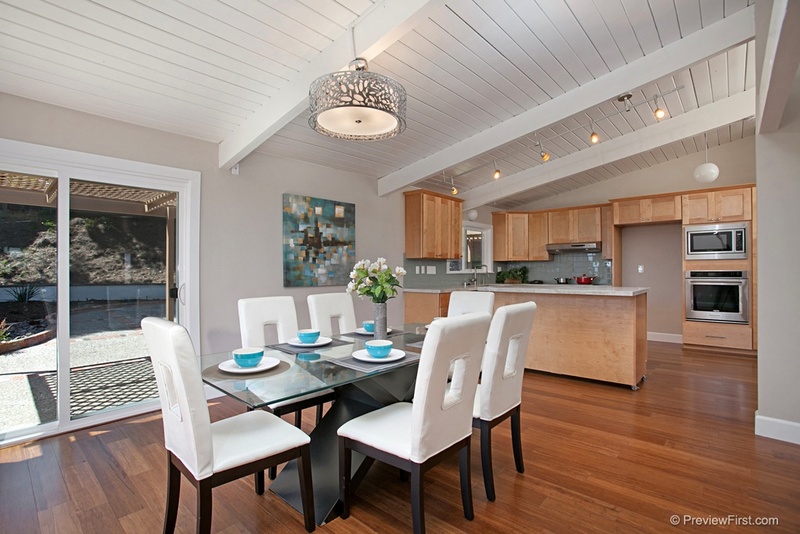 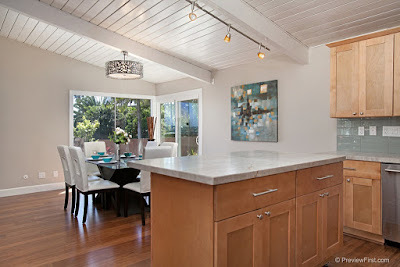 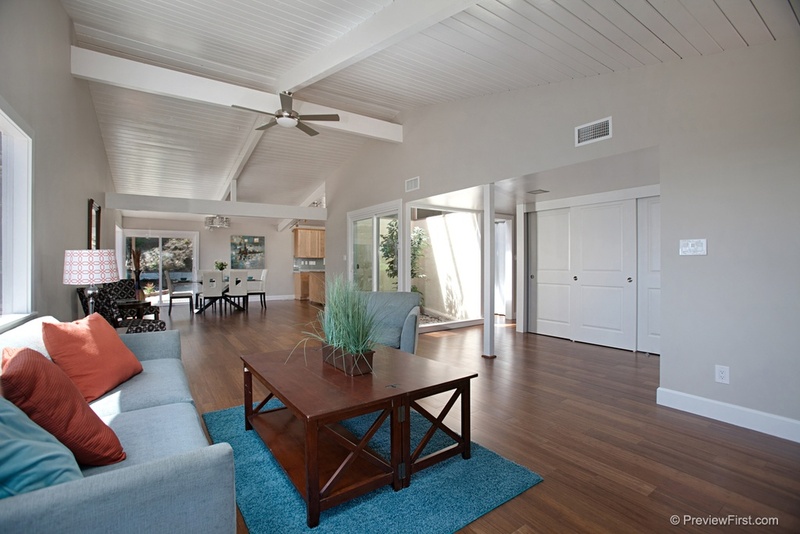 Situated in San Diego’s Pacifica neighborhood is todays Million Dollar Monday featured Palmer & Krisel-designed home. 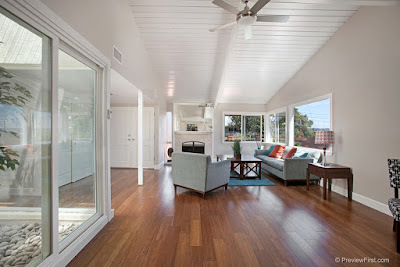 Built in 1961 by the Drogin Construction Company, this home features four bedrooms and two bathrooms in 1,920 square feet, features an original interior atrium and provides distant backyard views of Mission Bay while sited on a 8,900 square foot lot and carries an asking price of $1,075,000. 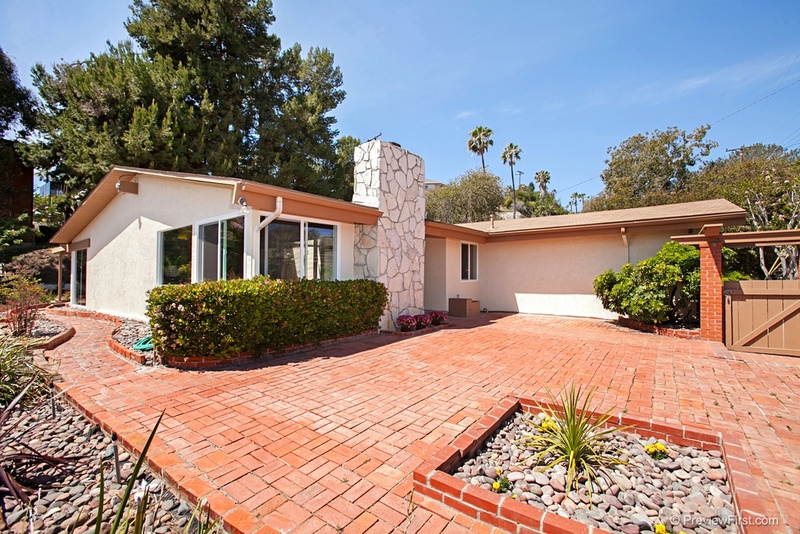 The home sits high above San Joaquin Drive, with a wooden privacy fence across the front of the yard. 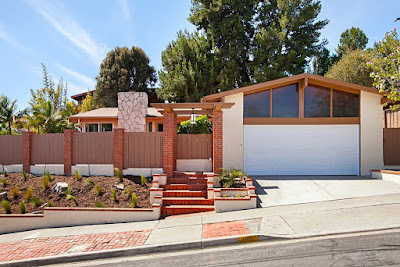 New landscape has been installed along the street side following the recent removal of two large mature trees, consisting of drought tolerant grasses set amid the remaining tree stumps. 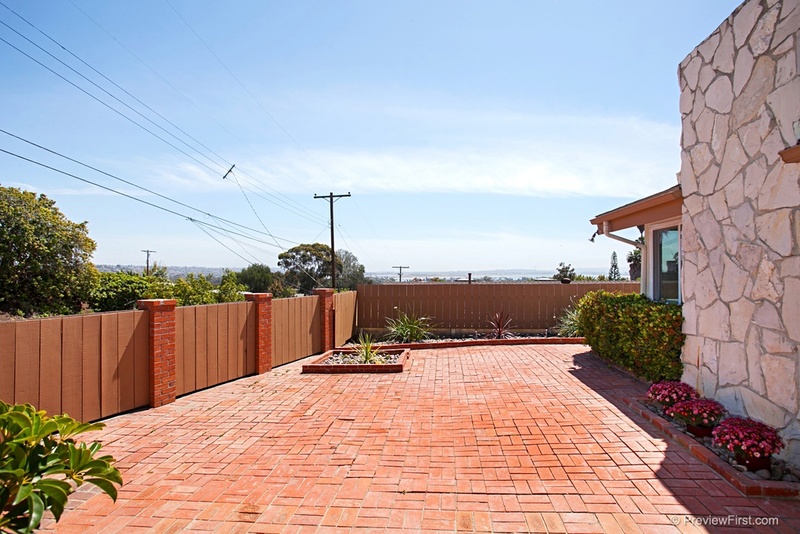 Behind the privacy fence, the front yard has a large red brick patio which offers distant views of Mission Bay. 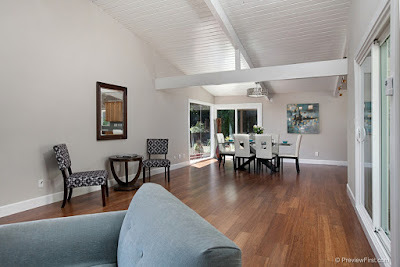 Inside, the living and dining rooms sit along the southern side of the home, while the kitchen overlooks the backyard and bedrooms clustered along the north side of the home. The original glass atrium sits opposite the entry, and provides light and greenery for the living and dining rooms. 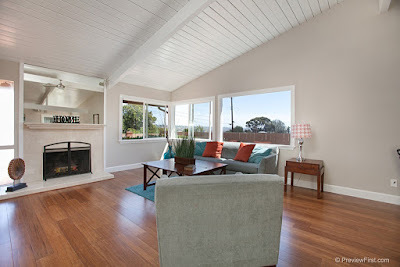 The living room is anchored by a fireplace, which has been updated to rid of of its original modernist looks. 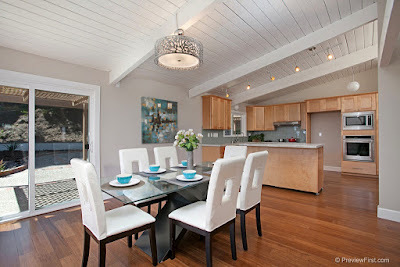 The dining room sits opposite the living room, features a large glass slider and corner window and is open to the updated rear-facing kitchen. 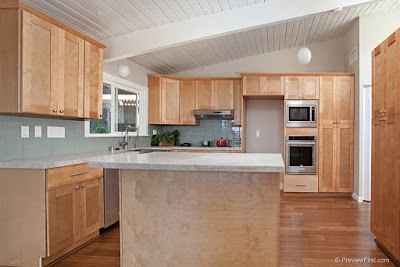 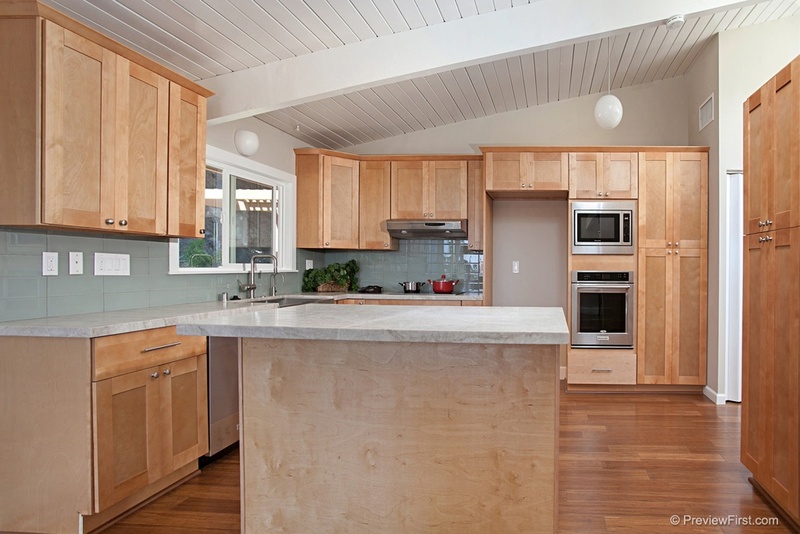 With shaker cabinetry, the kitchen retains a more traditional ranch house appearance. Marble counters and modern glass tile backsplashes complete the room. No telling where the fridge disappeared to, but the remaining appliances are stainless steel. 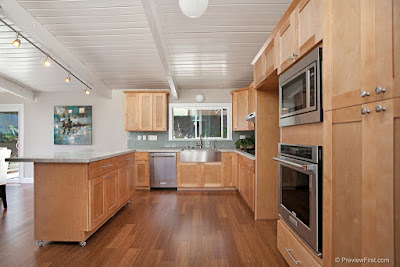 The center island is on wheels, an interesting touch offering flexibility to the kitchen and dining areas. 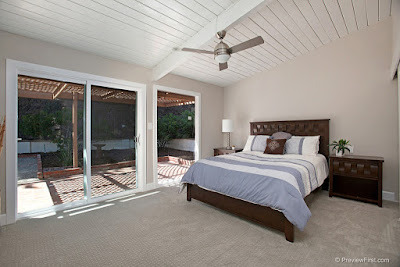 The master bedroom sits at the rear of the home, overlooking the backyard through a large sliding glass door which steps out onto a trellised patio. 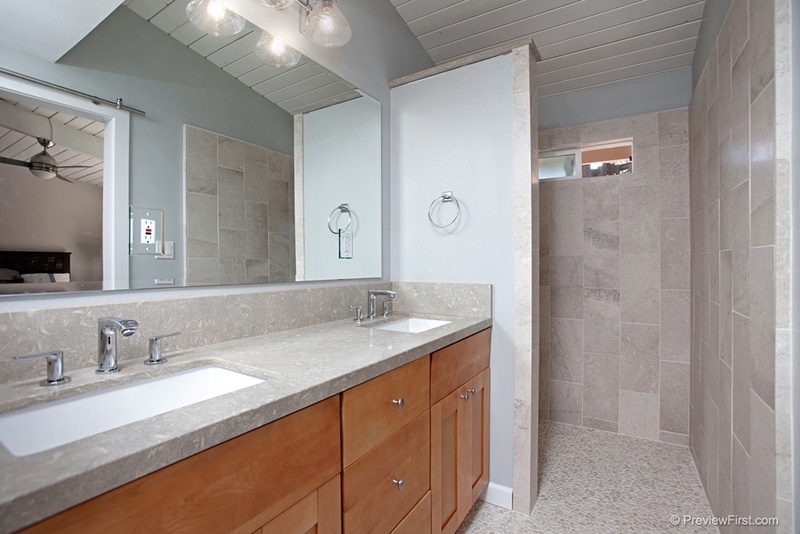 The master bath has been updated with cabinetry which matches the kitchen, marble accents and a skylight. 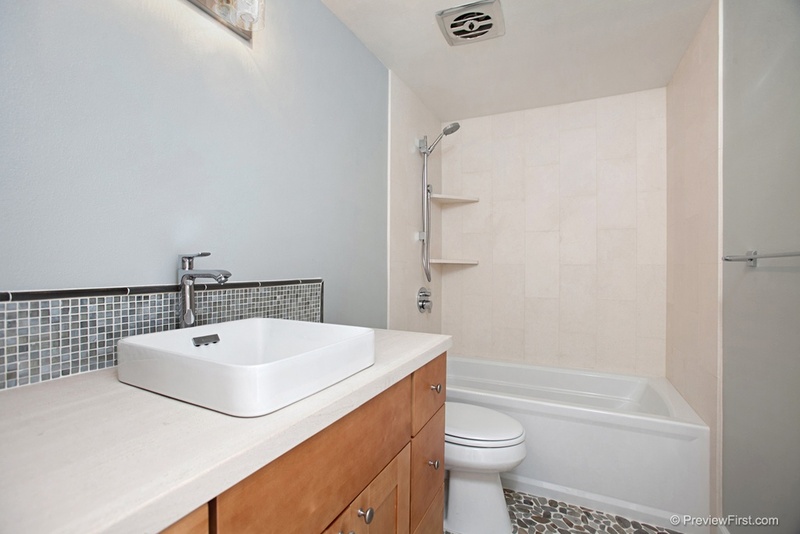 The guest bath features a busy combination of materials, including mosaic tiles, pebble tiles, shaker cabinetry, and stone tiles. The remaining three bedrooms lie along the north side of the home, but are unpictured for some reason. The west-facing backyard consists of a large exposed aggregate patio accented with red bricks. 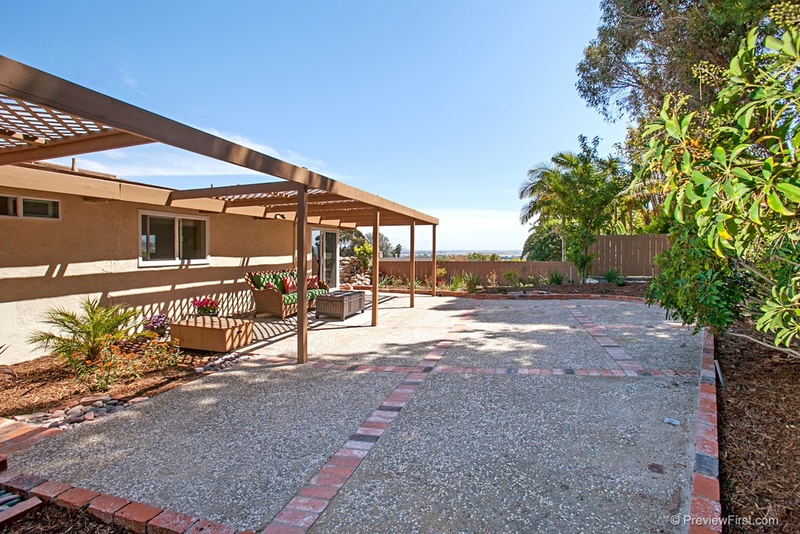 Wide planters surround the backyard patio, and a lowered fence along the south side of the yard offers distant water views. For those looking for a slice of midcentury modernism in San Diego, Pacifica offers a great architecture combined with outstanding views, and this atrium home serves up distinction with plenty of room to personalize.